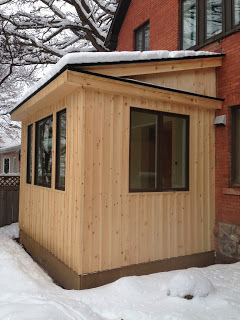 What Does a Home Addition Cost in Ottawa? Home additions come in many shapes and sizes. An addition can give a too-small home the extra space you need without going through a move to a new home. The two real customer quotes below will help you gauge the cost of an addition. Quote includes: Remove old addition, full depth footings and foundation, framing, structural beam for new opening from kitchen to extension, drywall, flooring, painting, peaked roof, shingles, windows and exterior door. Siding arranged by client. Lawn repair as required after construction. Five weeks required to complete. Remove old addition, new foundation, framing, multi-level insulation, windows, shed-style roof, shingle, drywall, siding, painting inside and out, and lawn repair as required after construction. 5.5 weeks required to complete.